Pézenas is an inland town midway between Nîmes and Béziers. 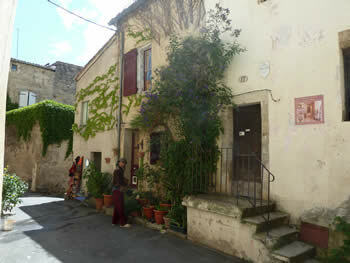 Pézenas was originally a marshy area rather than a town. It comprised lots of little villages built around a church and / or a chateau. In Roman times, there were luxurious villas in the area, as it was not far from the Via Domitia, the main road that linked Spain to Italy. It was the Templars who improved the region by draining the marshes, reclaiming land for agriculture and establishing farms. 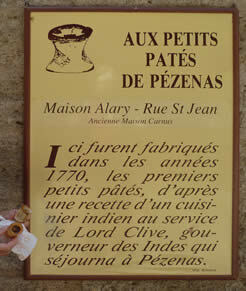 Pézenas soon became built up as a town, with big fairs to attract merchants. 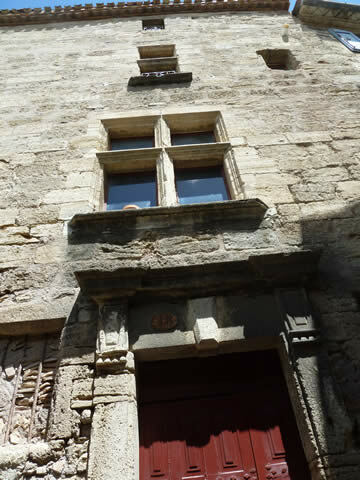 In the 1600s it was the capital of the Languedoc region and has many lovely buildings and carved stone frontages to remind people of the town’s important past. 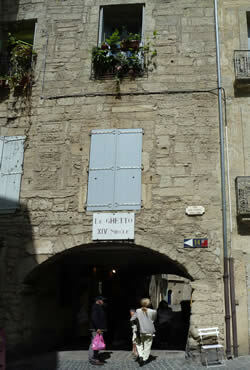 The famous French playwright, Molière, lived in the town and wrote some of his most famous plays here. Louis XIV was a visitor. 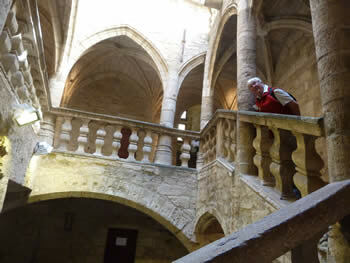 Stairway in the atrium of the 15th century Hotel de Lacoste, where Louis XIV and his court stayed. 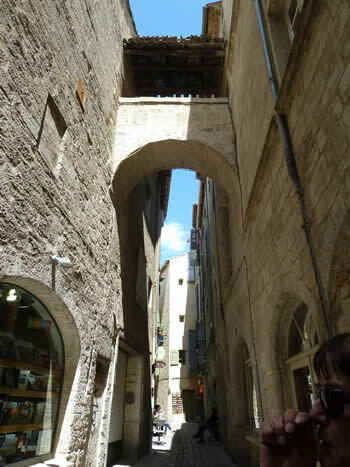 Many streets have vaulted passageways between the buidlings like the one below. 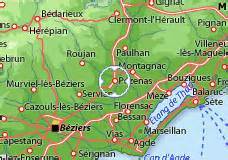 Nowadays Pézenas is a charming little town, with interesting old streets and churches and a well preserved Jewish Ghetto which dates from the Middle Ages. It is a centre for arts and crafts. 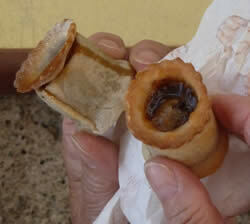 Le petit Pâté de Pézenas is like a cotton reel, and is a pastry filled with sweet and spicy mutton. You can eat them as a starter, or with a salad or even as a dessert. The story is that during the 18th century Clive of India stayed at a nearby chateau and had an Indian servant who prepared them as they were one of his favourite delicacies. The locals also found them very tasty, so the servant then taught the local patissiers how to make them. So these little pastries are now the local speciality! 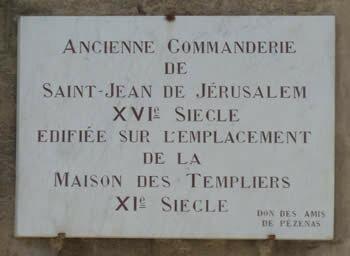 like many cities in Languedoc, Pézenas had a substantial Jewish population in the 13th and 14th centuries, coming from Italy, Spain and Portugal. The Ghetto is a reminder of this community, who were eventually expelled at the end of the 14th century - one of the last to leave France. 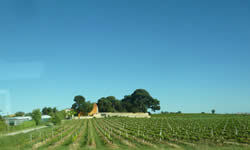 By the 19th century, the area had become famous for its wine production. After the vine disease Phylloxera destroyed nearly all of the French vineyards, this region was one of the first to restock using resistant stock from the Unitied States. Consequently, this brought a wine boom and great wealth to the town. Today, the town is entirely surrounded by vineyards. Unfortunately, the town could not match the industrial wealth of the north in the 20th century and became one of the poorest towns in the country. It suffered from its marshy surrounds and it was not until the draining programs of the late 20th century that it knew a renaissance. The Languedoc area became a sought after holiday destination, and locals and tourists alike began to appreciate the historical past and treasures of the old town.